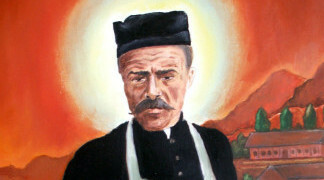 “A hundred years ago, on October 2, 1912 the Polish Jesuit Father Jan Beyzym died on Madagascar. Fourteen years before that day he arrived at the Red Island from Krakow (Cracow) to better the lot of the most miserable and unlucky island inhabitants - the lepers. He started to live with them at first in Ambahivoraka and then in the hospital he built in Marana. He treated their souls and bodies. He dressed up wounds on their maimed bodies, but above all, he tried to restore their pride and hope. He was their “servant”. Father Jan Beyzym is one of the most prominent personalities of the Polish Church. Formed by Ignatius Loyola “Spiritual Exercises” school, he implemented the evangelic ideal: “Greater love has no one than this that he lay down his life for his friends” (J 15, 13). The poorest were his friends and he really and truly “showed them the full extent of his love” (J 13, 1) - writes Card. Stanislaw Dziwisz, the Metropolitan of Krakow, in the introduction to a new book about Blessed Jan Beyzym titled “The Polish Samaritan” and written by Dorota Koziol. The book shows us the extraordinary personality of our compatriot, who left his beloved Motherland, left his dear land and his cherished Chyriv youth, whose educator he was, and went to remote, unexplored island to devote his life to Christ serving the lepers.